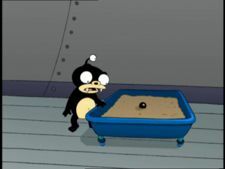 Nibbler looking at his litter box, which has a ball of dark matter in it (1ACV04). Dark matter is a substance that was widely used as starship fuel in the 30th and 31st centuries. The size of a pound of most normal materials weighs over ten thousand pounds as dark matter. Dark matter has existed in the form of a ball of no more than one inch in radius, which is excreted by the Nibblonians (1ACV04), and oil (3ACV02). Dark matter is material that makes up for the rotation of galaxies. In Physics, dark matter is an exotic particle (particles that are made from more than just electrons, neutrons and protons). Nibblonians are the only known source but other sources could exist elsewhere. Nibblonians are probably made of exotic particles as they came 17 minutes before the Big Bang (3ACV07), which explains why their feces are exotic matter, moreover their long lifespans are able to accumulate such matter in their time. The only place where dark matter has been known to be mined was the planet Vergon 6, now destroyed. It was completely filled with the heavy substance and imploded due to the lack of support for the surface after it was mined hollow (1ACV04). Dark matter was useless until 2970, when, while smashing some in a particle accelerator, Professor Farnsworth accidentally created a single non-local metaparticle and an anti-backwards crystal. Spacecraft fuelled by dark matter were fairly common until 3008, as proven by the availability of dark-matter fuel at orbital filling stations. In that year, when dark-matter prices started to rise due to a supposed shortage, the professor set out to render dark matter useless again and to ruin Mom's fortune with the anti-backwards crystal, which Mom technically stole from him along with the single non-local metaparticle. The two crystals were destroyed and all dark matter became useless once more (BG). The Planet Express ship's dark-matter engines burn the dark matter produced by Nibbler in its dark-matter afterburner, though exactly how this energy is translated into propulsion is understood only by the professor and his clone, Cubert, as, in 3000, the idea came to them both in a dream, but was forgotten by the professor in another dream (2ACV10). It is unknown whether Cubert remembers how they function. However, Cubert did explain that the engines move space around the Planet Express ship, which makes them function somewhat like a warp drive. Leela: Then go get the hover-dolly you didn't break and load all the dark matter into the left engine. Bender: Oh, man, that crap's heavy. This page was last edited on 26 December 2014, at 18:28.